Often fencing is used as garden demarcation or land/border divider with insufficient consideration to the overall garden aesthetics. Your fence can either substantially enhanced or diminish your gardens appeal, dependant on the style, finish and quality. Increasingly we are commissioned, throughout Yorkshire, to create bespoke fencing solutions that not only achieve the necessary border and privacy line, but also substantially enhance the gardens overall visual appeal. These particular clients had an existing decked area at there property. We were invited to create a fence to the edge of the deck a suitably modern fashion. We used pressure treated softwood in this scheme to create the boundary and add some privacy to an otherwise exposed area. The slatted screen works well here, wind is allowed to pass through whilst still creating an enclosed feel. We supplied and fitted a slatted screen style matching gate for this scheme, paying attention to detail, we made sure all the lines followed through allowing the gate to blend into the rest of the fence. 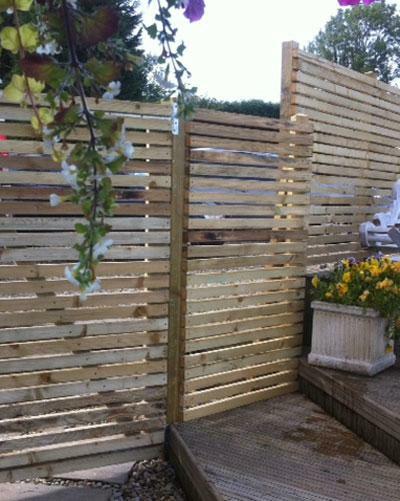 If you would like to discuss your fencing requirements, or for a free quotation, please call or use our Contact Us page.